Members of the King’s Society joined art historian and practising artist Gayna Pelham at the National Gallery for a masterclass entitled ‘The Art of Drawing’. Focusing on landscapes, the group studied two paintings by Dutch artists namely Meindert Hobbema’s The Avenue at Middelharnis 1689 and Philips Koninck’s An Extensive Landscape with a Road and a River 1655. Gayna explained the importance of locating the horizon and how to plot how each painting works in order to create a faithful representation. 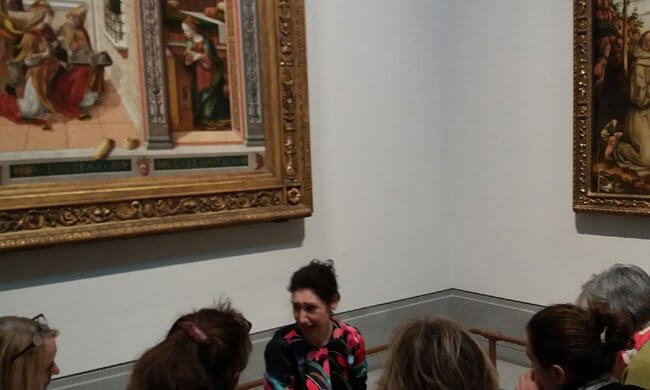 To conclude, she showed the group Carlo Crivelli’s The Annunciation with Saint Emidius 1486 which is the painting shown in the photograph with its extraordinarily busy canvas and unique portrayal of the Annunciation. Members left with their own drawings which were indeed wonderful first attempts at drawing.